Part one of the bt-Cocktail™ system contains Unichondrin ATP (Adenosine Triphosphate) to assist collagen and elastin production, increase mitochondrial activity, increase oxygen metabolism, and reduce inflammation. Energy 1 contains lichochalcon to help regulate sebum and ergothioneine to defend against free radical damage. Decreases inflammation, hyperpigmentation, and acts as a sebum regulator with lichochalcone. Increases cell renewal and, oxygen metabolic rate using ATP (adenosine triphosphate) which is the energy currency of life. It is the biocatalyst for all cellular activity including DNA replication, oxygenation and respiration to the cell, muscle movement, and neurotransmission. Protects against free radical damage with newest in antioxidant technology with ergothioneine. Professional Use – Use Energy 1 in bt-Cocktail™ treatments with the bt-micro™, the bt-nano™, and Bio Ultimate Platinum®. Home Use – Apply Energy 1 after TONE, to face, neck, and décolleté. Follow with bt-Cocktail™ Energy 2 and Energy 3. TPart 2 of the bt-Cocktail™ system contains Unichondrin ATP (Adenosine Triphosphate) to assist collagen and elastin production, increase mitochondrial activity, increase oxygen metabolism, and reduce inflammation. Energy 2 contains biodynes 03, which offers a 100% ozone protection factor. Biodynes 02. Protects the skin from high levels of ozone with an ozone protection factor. Contains the most powerful antioxidant to date ergothioneine. Protects skin cells against damage due to free radicals; which when left unchecked will cause a chemical reaction that eventually degrade the nucleus of the cell. Repairs the cells by stimulating elimination of excess toxins. Professional Use – Use Energy 2 in bt-Cocktail™ treatments with the bt-micro™, the bt-nano™, and the Bio Ultimate Platinum®. Home Use – Apply Energy 2 after Energy 1, to face, neck, and décolleté. Follow with bt-Cocktail™ Energy 3. Part 3 of the bt-Cocktail™ skin system contains Unichondrin ATP (Adenosine Triphosphate) to assist collagen and elastin production, increase mitochondrial activity, increase oxygen metabolism, and reduce inflammation. Energy 3 contains SYN®-TACKS, which allows improvements in barrier function and skin repair. Contains two active peptides within an ingredient compound called Syn®- Tacks, which enhances structural support to the cells, thus improving barrier functions. It also, works with cell signalling and cell differentiation. Protects living cells against chronic effects of solar radiation, free radicals and the skin’s immune system with ergothioneine. Professional Use – Use Energy 3 in bt-Cocktail™ treatments with the bt-micro™, the bt-nano™ and Bio Ultimate Platinum®. Can be used in finishing any facial prior to applying SHADE SPF 30. Home Use – Apply Energy 3 after Energy 1 and 2 to face, neck, and décolleté. Follow with SHADE SPF 30 for day. As with every living cell in your body, the skin requires a gigantic amount of the most vital form of energy that makes life itself possible; Adenosine Triphosphate (ATP). And this is for good reason, the skin is the single largest organ of the body! Although there are many, many factors associated with aging, energy in the form of ATP is the epicentre of cellular life, and this has everything to do with the way that we function, the way that we feel, and of course the appearance and health of our skin. The bt-Cocktail™ Ultimate ATP Synthesis product system is an extremely unique proprietary blend of the most forward thinking, efficacious ingredients available in skin care today. Together these ingredients allow for optimal cellular health by protecting, nourishing, and enhancing the capabilities of the mitochondria; where the heart of ATP is manufactured. This 30-45 day system will most definitely change the way that you perceive and feel about your skin, and yourself! It will allow for rapid, long lasting skin improvement results, with one full system suggested to be used once per quarter. During your off time, you can simply return to your regularly prescribed bT-Ceuticals™ product regimen to support your results ongoing. Reduces appearance of fine lines and deep wrinkles. Shrinks pore size and stimulates clearer, smoother skin. Improves skin elasticity, firmness and overall skin tone. 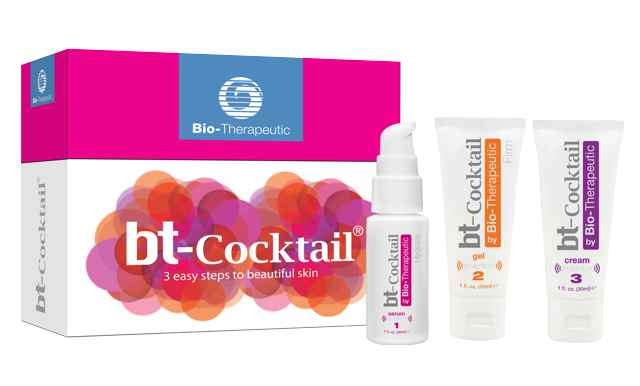 We invite you to unlock your youth from within, and be amazed at the way that your skin will look and feel after you have first-hand experienced the bt-Cocktail™!